There are lots of things you need to start a business but why not you first learn from the mistakes of others. Wouldn't it be great if your foresight was as good as your hindsight? Well, unfortunately, it's not good. But as you know it can be easy to look back on your mistakes and see exactly where you went wrong and most of the time you will even know why you went wrong and you can also have the advantage of looking at the mistakes others have made as well. The important thing for you as a business owner or as a potential business owner is to do everything you can to avoid mistakes. So, what do you need to start a business? 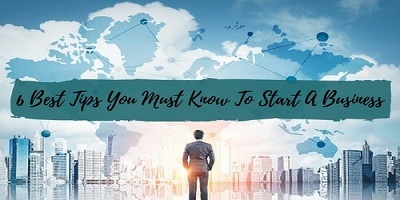 Here are 6 best tips to learn about all those things that are for sure, make your business successful and you must know if you are starting a business. You have probably heard the old saying “if you don't plan then plan to fail”. It's so easy to try starting a business without a business plan but your chances of failure are a lot greater and it is most likely that without a plan you will wind up wavering all over the place. It's easy to know where you want to go but it's not so easy to know how you're going to get there. But if you have a good plan and follow it then your chances will be much better off enjoying success. Think of it this way! If you don't have a plan then you're guessing and unfortunately, there are a lot of business owners who don't have plans and even worse based on their business without a plan. Most of us would not start on a long trip without a plan, but we'll start a business without a plan. You see, a business plan will actually help you know your business better, know your industry better, your competitors, your suppliers, your market and your financial status better. When you know the business side of your business well, you're probably going to operate your business well and that comes from planning. Read the 7 steps guide on how to create a solid business plan. Can you handle a business? What will be the effect on your family? Are you a good manager of things? How much do you know about the business side of a business? Do you know how to develop a plan that will take you out 15 years? Will you seek advice when you need to? So study yourself very well and then decide which business is best for you to start. Stick with the plan and know exactly where you want to go and stay on course and don't get distracted. Again you see if you don't have a plan you've already lost your discipline. There are so many things that will distract you, but if you are disciplined enough you won't be pulled away from your goal. If you can't follow schedules, you may not be as disciplined as you think you are. It's really that simple. There are so many ways nowadays to market your products or services and it’s very wise to choose one that fits your business best. Do your research, know which marketing methods is best for you. When you do it in a right way, you can actually know what size your market needs to be and know if your market is actually big enough to cover your business plan. But if start your business without planning you won't know, what size your market needs to be and whether you will have enough customers. Too many business owners gauge their business by the cash they have on hand and not by their profit and profit margin. Just because you happen to have a lot of cash does not mean you are making money. I see business owners watch their bank account balance only and from this, they will determine if their business is doing well or not. The start-up cost is another area that can think you before you know it if you are not watching closely. You need to know when your revenue will begin. Doing a startup costing plan is just about the only way to have an idea about the startup business. This is simply listing all your onetime cost and ongoing cost and when you expect revenue to start coming in and how much that revenue will be. If you have more people working for you than just yourself, then delegate a lot. Teach your people to be responsible and to make as many decisions as they can on their own. Before decisions have to come through you will find yourselves having to spend all your time in your business and none on the business side of your business. This can be very risky! These are the six pitfalls that can create a lot of problems for you. So, avoid them if you possibly can and you will be better off with your business.